Founder & Executive Director of TruArtSpeaks, Tish Jones is a poet, performer, educator and organizer from Saint Paul, Minnesota. She has performed at CBGB, Kaplan Theater, The Walker Art Center, Intermedia Arts, The Cedar Cultural Center and more. Her work can be found in the Minnesota Humanities Center’s anthology entitled, Blues Vision: African American Writing from Minnesota (Minnesota Historical Society Press, 2015), the 2011 and 2013 Saint Paul Almanac, and the Loft Literary Center’s Nation of Immigrants audio CD. Currently a fellow in the inaugural Intercultural Leadership Institute, Jones has always had a passion for bridging arts & culture, civic engagement and youth development. Her work explores the ways in which art can function as a tool for social transformation, liberation and education. 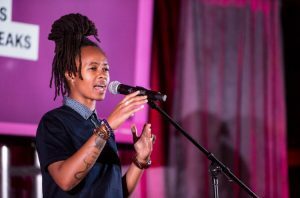 When you think of Tish Jones, know that she is somewhere dismantling age old systems of oppression, putting on for Hip Hop culture and creating new art to move the conversations forward.